Latency is the delay from when the computers commands that the lights come on and when they actually turn on. This delay will vary by controller and the method used to transfer the data to the lights. In fact, the computer may put delays into the system, depending upon how well it times the output of the messages. The delay between sound and video has been thoroughly tested by the television broadcasters. Figure #1, indicates when most people can detect the errors between video and the sound. The broadcasters try to keep the value between -30mS and +22mS (R-REC-BT.1359-1), so that errors in the transmission of the video do pass the thresholds below. I used 50mS timing for my lights last year and could tell during parts of the sequences that I did not have the timing quite right, so I suspect that with music timed to lights you want to do better than the detectability threshold. The obvious answer is to adjust your music beats by -25mS. To give everyone an idea of how long it takes to transmit data for the various interfaces, I have plotted the delays in figure #1. The chart and table indicate the time to transmit a pixel, which is three channels in microseconds. There are several things that you can note from figure #1 and table #1. First, the slow speed of the Renard is evident and the number of pixels/channel limits are shown visually. 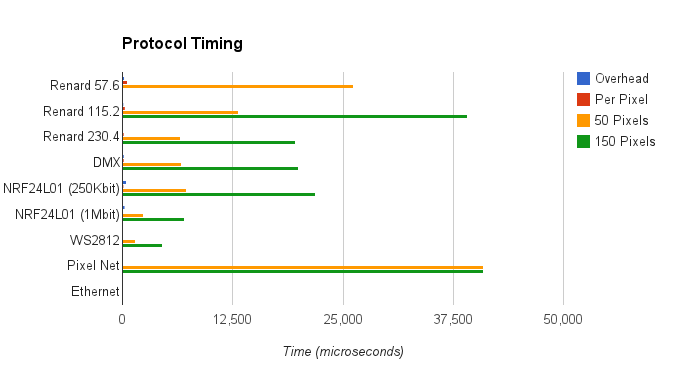 Second, the speed of Ethernet is the distribution protocol of choice, since it does not even show up on the graph. Third, Pixel Net always takes ~41mS to transmit all of the data, so it is not suitable higher refresh rates. Most of the USB dongles that you will buy will be high speed devices, the speeds are shown in the notes section. Since these are hardware devices, the output will start as the data becomes available from the computer, so the main delay will be the serial output. The NRF24L01 speeds are estimates and match fairly closely with the tested values from my hardware. This will change depending upon the output mode used. Finally, I would like to point out that the latency will be summation of all of the protocols used to send the data to your lights. For example, the PX1 is a Renard to pixel converter. The output comes from a USB dongle or Ethernet device, is converted to Renard, is received and output as pixels (WS2811). The Renard receiver can not start tranmission of the pixel output until all of the data is received, since a pause in the output is an end of frame indication. 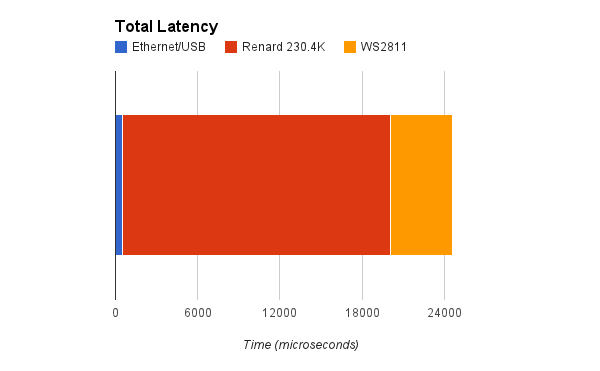 So the total latency is a summation of all of the delays. This is shown in scale for 150 pixels at 230.4Kbaud in figure #2.